So coming back to where we were. As the network is spreading and more and more areas are getting connected, the crowd of daily commuters by metro is increasing. I think, DMRC can brag the honour of being the highest revenue grosser in the NCR (National Capital Region) now. Most people scoff at the many ill-reputed areas (Mundka, Jahangirpuri etc.) being connected by the metro which according to them will soon pollute the traveling gentry by diffusing the notorious with the patricians. Stray incidents of pick pocket, eve teasing and other such messy muck have also been reported. I do not know how we define gentry. But generally speaking, metro is thronged now by the populace which was earlier jostling for space in the overcrowded and famously infamous Blue Line buses. These buses, responsible for many gruesome accidental deaths in the Capital, nurtured a positively homicidal streak. It was rumoured that many political big wigs had their money invested in these when transportation became privatized in the city. The owners on the forefront were suspected to be just the façade. The drivers and conductors were untrained, unruly and many found driving under the impact of intoxicants (most hailed from the Haryana belt). Roguishly competitive on road, they did not care two hoots for the safety and security of the passengers or pedestrians. It is, therefore, after a prolonged battle with a very, very strong lobby that the Delhi Administration finally put a ban on these buses. Metro, in its full fledged splendour, happened after a considerable period of time. In the absence of none, it soon emerged as an alternate recourse for commuting - the undoubted Messiah for thousands of commuters who were virtually rendered immobile by the resultant lack of adequate number of public transports after the Blue Lines were lifted off the roads of the Capital. Not only was the mode different now, but it also earmarked a technological leap (after Kolkata) in the history of transportation of the country. I feel that there should be crash courses to get acquainted with new technology (ies) as and when they gate crash into Indian market. Remaining backward for so many centuries have put us at a disadvantage of not knowing how to adopt or accept a new marvel and adapt ourselves to it accordingly. This I say after observing the commuter behaviour in the metro. At first there were no queues on the station, more so because initially, as I said earlier, there were comparatively much less number of commuters. Even then as the train entered the station, the pushing, trampling and jostling would begin. Who would enter first and grab a seat would be the reasons for competition. 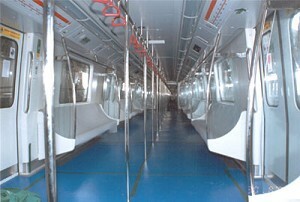 (Some were also afraid that the auto-doors would close down on them if they did not hurry!) Though, it did not make much difference since a standing journey was equally comfortable, yet as they say, times (read technology) change but people do not. Thus means changed but attitude did not. Even after the exit of the Blue Line, the psyche of the masses lingered on. The acquired commuting skills and haste of a Blue Line marauder could not be forgotten/given up easily and was unwittingly relayed forward to the metro. Now, it seems as though it has been genetically transmitted to the gen next. Thus, it is the undisciplined behaviour of the public that necessitated queues and also queue administrators. The ethos of Delhi, unlike Mumbai and Kolkata, is different. Here smartness is personified by one’s grabbing skills, or in more sophisticated language, the killer instinct. He who breaks the rule, the more irreverently so, is considered the most intelligent. Queues are formed to be readily dismantled as soon as the train enters the station. If the guard tries to bring to book a line breaker, the latter promptly points out “Hum line mein hi hai……..” which one is the million dollar question. There was this old guard deputed at Kashmere Gate Underground Station. He was very loyal to his duty and would chastise all queue-breakers in his inimical somewhat Sholay’s Asrani like style and mannerism. Sometimes, in his sincerity he overdid his job and underscored rudeness heavily. How the crowd hated him! Invariably a heated exchange between him and a passenger would transpire into a station brawl while the rest of the crowd would just jeeringly look on. We, as a nation, are an indecisive lot and detest finality. Even in an argument, which concerns public convenience and civility, we cringe to take sides and reach a conclusive statement. Thus, such scenes would often recur till one day the guard was replaced by his more diplomatic (?) counterpart and was seen no more.